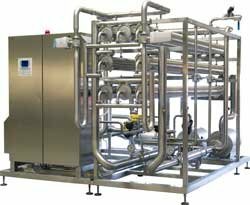 SepStream systems are pre-engineered and cost-effective membrane systems for multi dairy applications. The plant employs tried-and-tested reverse osmosis (RO) technology to separate and concentrate milk residues back to their original composition or higher. Our SepStream systems separate and concentrate whey or milk raw material to create new, value-added main stream products or ingredients with no waste as the process also produces a high-quality water main stream.